Back in the 1990s, the most celebrated footrace of our province was called the “Tri-city Marathon.” Though it wasn’t officially a marathon (whose strict definition involves a distance of 42.195 kms. ), it was the most looked-forward-to and exciting race of its time. Foreigners landed in Mactan to join. The elite long-distance stars from Manila arrived to compete in the 32K. Ordinary folks dressed to impress while wearing sneakers. Organized by Joy Augustus Young, then (and now) Cebu City Councilor, it was festive and encouraged the participants to dress in loud, colorful and fun costumes. It was a mardi gras and run merged into one carnival. 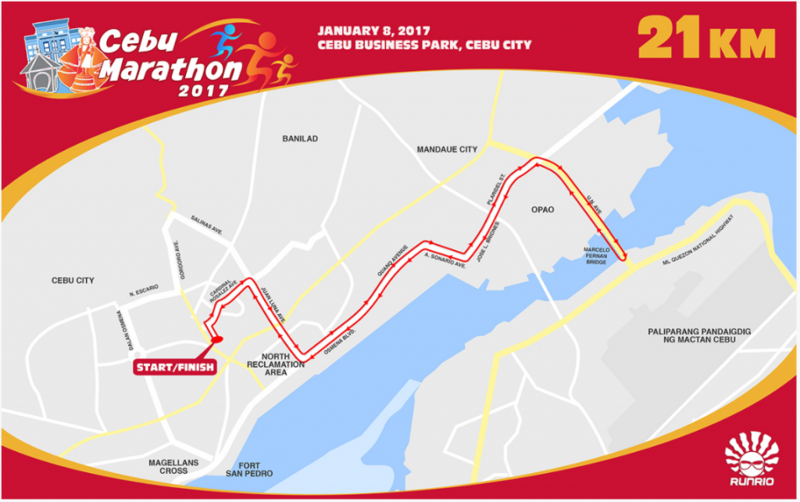 Come January 8, 2017, we hope to revive this “Tri-City Marathon” with our very own Cebu Marathon. Why tri-city? Because it will involve the three largest cities of our island: Lapu-Lapu, Mandaue and Cebu. The Cebu Marathon had always started and finished at the Cebu I.T. Park. Back in 2008 when it was the Sinulog Half-Marathon, runners started their trek and finished all-sweating in Lahug. Ten years later — for the 2017 version — we’re still in the Ayala-owned property but this time it’s at the Cebu Business Park (CBP). The space inside the Cebu I.T. Park is congested with high-rise buildings and restaurants. There’s no more room for a marathon event there. The new start/finish area will be along the Negros and Bantayan roads of CBP, near the gleaming and tall MSY Building. MARCELO FERNAN BRIDGE. For the 21K and 42K participants, it will be a brand-new route. The half-marathoners will depart CBP and run towards the Mabolo Church and turn left at the SM City Cebu. From there, it’s a nonstop path along Ouano Avenue and Jose Briones St. until you turn right at the U.N. Avenue before climbing the bridge, descending into Mactan, and making a U-turn and running back to CBP. It’s an out-and-back 21K course. With the 42K, we’ll ask the runners to meander along the main Cebu City streets first — to view the Sinulog lights and sights — before heading towards Mandaue and Mactan. 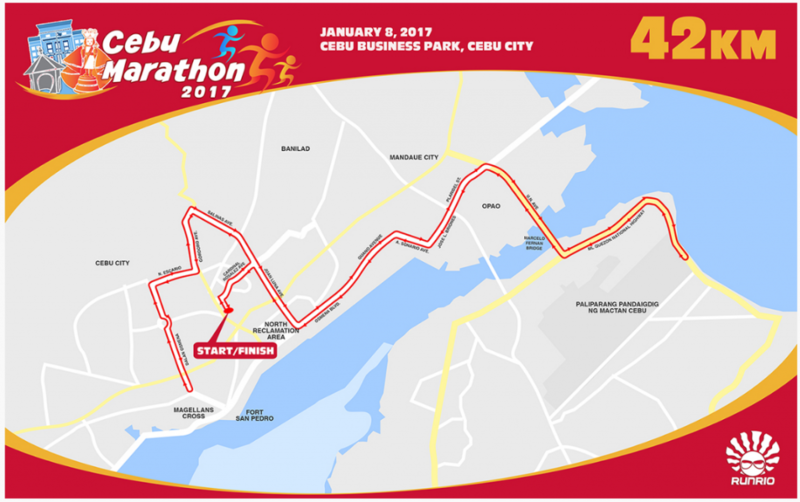 Why the change of route when the Cebu Marathon had always traversed the SRP and Talisay City? Well, as the slogan “Change is coming” is propagated all over our 7,107 islands, this event might as well join the mantra. Second: the smell. The headlines scream about the foul odor near the SRP and Talisay portions and we wouldn’t want our international visitors to inhale this air while huffing and puffing. The sport of running is difficult enough; imagine the extra suffering by breathing the foul smell? Most of all, the Marcelo Fernan Bridge is a symbol of Cebu; and what better destination to surmount and climb. Since the Cebu Marathon falls under the Sinulog week, the usual loud music and drum-beaters and entertainment will uplift the runners. There will be at least 14 hydration stations for the marathon — complete with Gatorade drinks and Nature’s Spring water. Registration starts today! Just visit the website www.cebumarathon.net and you’ll have your choices of four categories: 5K, 10K, 21K and 42K. For those who want to register in person, the onsite registration will commence on Oct. 10 at the Active Zone of Ayala Center Cebu. RUNRIO. For the thousands who joined the Milo Marathon race last Sunday, it was another very well-organized event. I ran alongside our Cebu Executive Runners Club (CERC) president Steve Ferraren and, in terms of safety, hydration, entertainment and overall management, there is no better organizer of foot races in the Philippines than Rio de la Cruz. The RunRio team — who also organize the Condura Marathon and the Run United Trilogy, among others — is a big group of professionals that include Franco Bambico, JP Aranda, Rommel and Allan Balester and many more. And, like the 14 or so Milo races all over the country, RunRio is once again helping organize the Cebu Marathon. In partnership with the CERC, which founded this event a decade ago, RunRio will put their experience and expertise to good use come January 8.